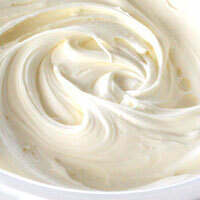 A creamy cheese classically used in tiramisu. 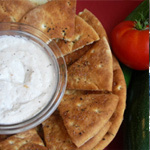 Great with fresh berries, ciabatta, or in savory pasta dishes. Line the sieve with the cheesecloth. Place over bowl. Heat cream over medium heat stirring constantly. 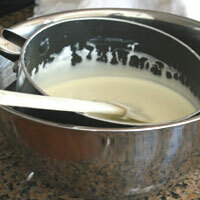 When cream reaches 100 degrees add the tartaric acid. Continue to stir until mixture has reached 180 degrees. Remove from heat. Cool to room temperature. To speed the cooling process you can use an ice bath. 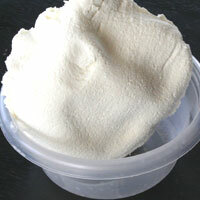 I ordered tartaric acid online through cheesemaking.com. It was $5 for 4 oz. The recipe only uses 1/4 t, so it lasts a long time. I have had mine for several years and it still works great. Place the pan inside and stir constantly until cooled. 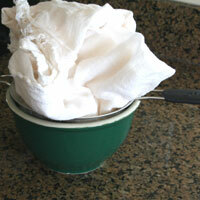 Pour the mixture into the prepared cheesecloth. If the mixture is properly cooled it should not drain through. If it does drain through pour it back in the pan and let it cool a little longer. 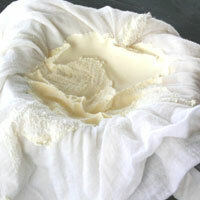 Loosely wrap the sides of the cheesecloth around the top. Enclose in plastic wrap or a plastic bag. Refrigerate overnight (about 12 hours). The cheese drains slowly, so a long refrigeration is necessary. If you used it right away it would be thin and acidic. After the refrigeration remove the cheese from the cloth and place in a bowl. Stir vigorously until completely smooth. There should be little and sometimes even no liquid in the bottom of the bowl after the 12 hour refrigeration. 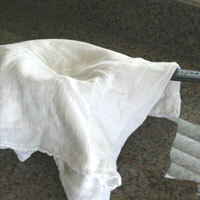 The cloth should be soaked because much of the liquid drains into it. The liquid that is drained should be clear. If it is white, too much liquid drained. Make sure you follow the temperature heating and cooling instructions exactly. If it still doesn’t work try a different brand of cream. It is ready to use. Can be refrigerated up to one week. This recipe freezes well. Thaw in refrigerator 8-12 hours before using. Heat can ruin it. 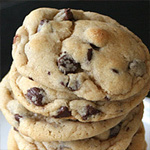 Heating - If the mixture is not heated to 180 degrees it will not set properly. It will also not work if it is heated much above 180 degrees. 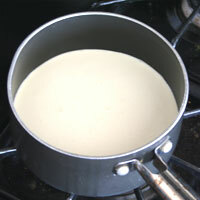 Cooling - If the cheese is poured into the cloth while hot it will drain through. Cool to room temperature or a bit lower, then pour it into the cloth. Brands of Heavy Cream - I have had better luck with some brands than with others. I think it is possible to get any of them to work, but you may have to pour it through the cloth twice. Wal-Mart's Great Value brand seems to work the best. Costco's cream doesn't work very well. 1. 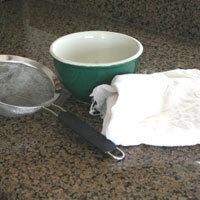 Line the sieve with the cheesecloth. Place over bowl. 2. Heat cream over medium heat stirring constantly. 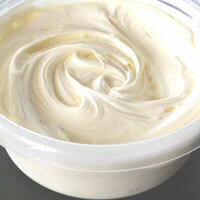 When cream reaches 100 degrees add the (1)tartaric acid. 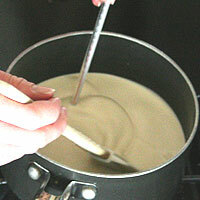 Continue to stir until mixture has reached 180 degrees. Remove from heat. Cool to room temperature. 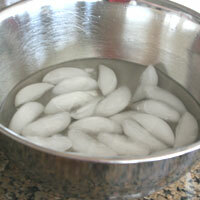 To speed the cooling process you can prepare an ice bath. Place the pan inside and stir constantly until cooled. 3. Pour the mixture into the prepared cheesecloth. 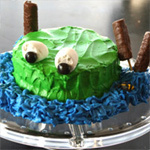 If the mixture is properly cooled it should not drain through. If it does drain through pour it back in the pan and let it cool a little longer. 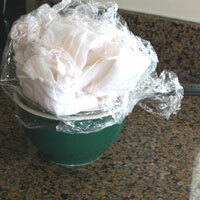 Loosely wrap the sides of the cheesecloth around the top. Enclose in plastic wrap or a plastic bag. Refrigerate overnight (about 12 hours). The cheese drains slowly, so a long refrigeration is necessary. If you used it right away it would be thin and acidic. 4. 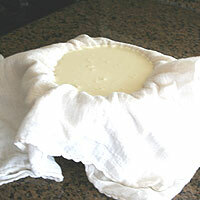 After the (2)refrigeration remove the cheese from the cloth and place in a clean bowl. Stir vigorously until completely smooth. 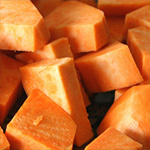 Cover and refrigerate up to one week. (3)Freeze up to 6 months. 1. I ordered tartaric acid online through cheesemaking.com. It was $5 for 4 oz. The recipe only uses 1/4 t, so it lasts a long time. I have had mine for several years and it still works great. 2. There should be little and sometimes even no liquid in the bottom of the bowl after the 12 hour refrigeration. The cloth should be soaked because much of the liquid drains into it. The liquid that is drained should be clear. If it is white, too much liquid drained. Make sure you follow the temperature heating and cooling instructions exactly. If it still doesn’t work try a different brand of cream. 3. This recipe freezes well. 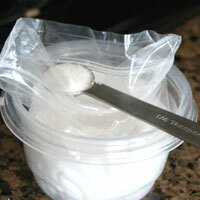 Thaw in refrigerator 8-12 hours before using. Heat can ruin it.